With three months to go to the first gun off Dun Laoghaire’s famous harbour, 410 boats are already entered — and more than half the entries are visiting craft. More than 70 different sailing clubs are represented, including the Channel Islands, Isle of Man, UK, Scotland, Wales, Northern Ireland, from which there are currently 111 entries, and across Ireland. In a nod to the event’s growing international stature, an early entry has been received from the Royal Hong Kong Yacht Club with ex-pat Jamie McWilliam sailing the production IRC race boat Signal 8, an impressive Ker 40 design. Growing over the last 14 years, the regatta is now proudly one of Northern Europe’s greatest shows on water, eclipsed only by the UK’s Cowes Regatta, one of the longest-running regular regattas in the world. 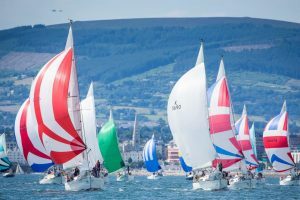 “Since it first set sail in 2005, Dun Laoghaire Regatta has grown biennially and showcases the very best of Irish sailing action on the water. With a festival this size, the regatta also adds a lot of shoreside summer colour to Dun Laoghaire town”, Event Chairman Don O’Dowd said. In an effort to protect our waters we are running the event as a Clean Regatta through the international Sailors for the Sea programme, supported by the MaREI Centre, which will see us implementing a number of Clean Regattas Best Practices to reduce our environmental impact.” O’Dowd added. The Volvo Trophy is on the line for the overall winner of IRC and 2017’s winner, Joker II, a local J109 design, is back to defend it. Joker II, under skipper John Maybury, was also the class winner of the highly competitive Class One, and two years later this class has only got stronger with some new local marques such as Andrew Algeo’s J99 Juggerknot II, as well as Scottish and Belfast boats contesting this division. The Scottish boats come to Dun Laoghaire under the recently developed RC35 class banner that will make the 35-foot regatta one of the most keenly contested battles of the season. As well as Class One, key classes in the line-up include the other IRC rating classes with a visiting fleet of vintage Half Tonners from Howth contesting Class Two. In addition, ‘one design’ classes will include the Beneteau 31.7s, Beneteau 211, Sigma 33, Ruffian 23s, Dragons and the RS Elites, who stage their British Championships as part of the VDLR, currently with 34 entries. The dinghy classes will include the GP14, Wayfarer, Squib, Mermaid, Flying Fifteen, and single-handed Lasers and Moths. Following 2017’s harbour bicentenary celebrations as part of the regatta, Myths & Seabird Half Raters from the 100-year-old Trearddur Bay in Wales are crossing the Irish Sea again for the July festival and will join Dublin Bay’s own historic classes for a classic boat regatta as part of the overall regatta.